It can be hard to take a good photo of yourself with the iPhone camera. You have to hold it awkwardly at arms length in front of you, and then try to tap the shutter release button when you feel the camera is aimed properly. Chimera by Helix Interactive helps tackle this physical challenge, while adding some additional photo-editing features. Set Things Up: Chimera’s Camera panel is the most useful area of the app, with settings for how to review each image before saving and whether to wait until the app detects faces before it takes a shot, among other options. The core function of Chimera is built around the app’s face detection functionality, and this is where the real value lies. When you launch the app, you initially see a camera interface much like the native camera app. In the lower right corner, a Tool button can summon a panel with four areas for you to adjust: Camera, Faces, Color, and Effects. 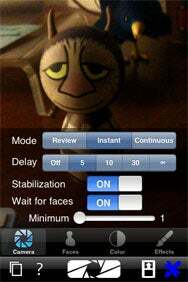 The Effects panel offers a variety of options available, from simple Greyscale and Sepia choices, to Night Vision and Cartoon outlines. Some may have fun playing with these options, but what makes Chimera helpful lies in the other panels. The Color panel give you the choice of adding High Contrast adjustments to the images or automatically adjusting the White Balance. You can also choose to optimize these adjustments for faces. The Faces panel provides a few basic settings related to the face detection itself. There are two Quality options you can chose from: Faster or More Sensitive. When Chimera detects a face, it shows a green box around the face to alert you that it is locked in, much like an auto-focus lock signal on a SLR camera. In the Faces panel, you can choose to have this green box remain visible when you preview the image before saving. You can also choose to have the green box remain on the finished image that you save to your camera roll—I’m not sure why you would want that. The most useful area of the app is the Camera panel. Here, you can chose exactly how the photo will be taken. You’ve got a number of options from which to choose to help you get the desired shot. The Mode setting allows you to decide whether you’d like to review each image before saving, save each shot instantly, or save an image each time you click the screen. There is also a Delay and Stabilization option that can be toggled, if you’d like a few seconds between when you click the shutter button, and hold the camera out in front of you. Finally, there is an option to “Wait For Faces,” and also to select the minimum number of faces detected (from one to three). When selected, the photo will not be taken until the minimum number of faces are detected. Chimera also allows you to click anywhere on the screen to take the photo, not just on the small shutter button (another helpful feature when you’re holding your phone with the screen facing away from you). So what do all these options add up to? Say you and your friend want to take a photo. Normally, you’d need to hold the camera in front of your faces, and awkwardly tap the camera button, hoping the image turns out straight without cutting off anyone’s face. With Chimera, you can set it so that the app waits until it detects two faces and give yourself a few extra seconds to get your arm out of the way. Face detection is never perfect, but in trying out Chimera, I got more consistent results than I would have been able to with the built-in camera app alone. My biggest complaint with Chimera is that it doesn’t launch into the Camera panel by default when you go into the settings. The Effects may be a bit of fun, but I found them overdone, and not something I would use. The meat of the app is in the Camera panel, and I’d prefer to go straight there. Beyond a few complaints about the interface, Chimera is a helpful app that does a surprisingly good job of face detection. You may not need the ability often, but for the times that you do, it can be a big help in getting the shot you had in mind.